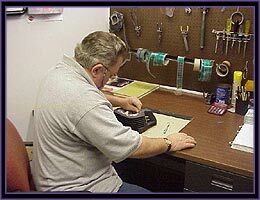 All products or parts that arrive at our facilities regardless of size or quantity, will be inventoried by our customer service rep and our customer. In the case of "mail orders" letters describing detail and color will need to accompany the products). All job's receive a "job order work tag sheet". This work sheet will follow our customer's job from start to finish. The sheet will track part count, blast time, outgassing of parts, degreasing time, wash & racking time, powder coating, baking, packaging & shipping, and misc time. This sheet also tracks color choice, arrival time and approximant shipment date. Why do we do all this? Because this helps us to keep track of all aspects of your parts, we want our customers to get back everything they sent us! This also helps us to bill our customer the correct and fair amount. Whatever your interest or need may be, from restoration, marine, industrial, to show, the key to an excellent finish, is proper surface preparation of your part. Your parts may only require a chemical surface prep, or a pass through our chemical wash tank. They may need to be "out gassed" to remove impurities trapped deep in the part. 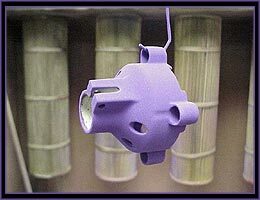 This is a "must" for many used parts and castings. 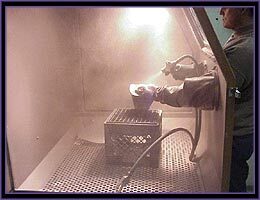 Your parts also may require more intense cleaning of the surface, this is done by "media blasting" your parts, using aluminum oxide or glass bead, then followed by a "chemical pretreatment" and "bake dry process" @ 275 degrees F for 15 min's. The process needs, are based on the parts application and the parts surface material. 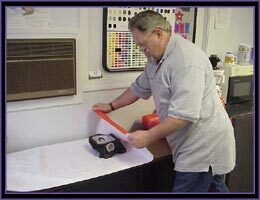 All this surface prep is a "must" in providing an excellent "bite" for the powder coating, and providing superior adhesion and longevity. Prior to powder coating we carefully review our customers work sheet and mask and plug all indicated surfaces, using special high temperature silicone tape and plugs. This insures a professional job. Next, we look for the best place to "hang" your part before powder coating your finish so as to not show a hook mark. This is followed by "racking" your parts onto our special baking racks prior to powder coating. The parts are then "powder coated", with a special "powder coating gun" that puts out around 90 kilovolts of charging voltage. This causes the "powder" to pickup a "positive charge" which needs to find "ground". This "ground" is in our environmentally controlled powder spray booth which has an "earth" ground. This attracts the powder to the "natural part". We then carefully remove the parts from the spray booth being careful not to touch the parts prior to the baking process. (remember it is still in a baby like powder form). 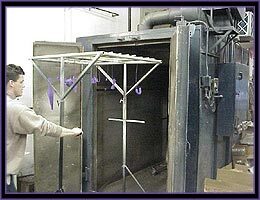 We then place the racks which are full of parts, into one of our baking ovens. These oven are natural gas fired and use convection heat to cure the "powder coating" at a range of 375-400 degrees F for 15-25 minutes. "Convection ovens" heat the air by "rolling" the heat evenly around the part, allowing the part to be heated uniformly. This is critical in properly curing the coating. We also run 2 temperature sensitive laser guided heat guns to make sure that the parts are at the correct cure temperature. These guns are extremely accurate. Once we reach the "bake time" we set our industrial timers for the correct time. All parts exiting the ovens once cool, are followed by our inspection process. 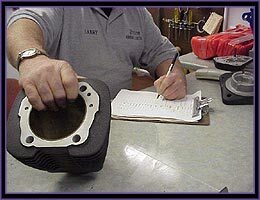 Any parts that do not pass our strict inspection, run back through our process for a recoat. note): some products made of poor quality materials may show less then perfect results. We will do everything we can to minimize these problems. You may be advised to put your part in a textured finish which will hide many flaws! After inspection, all of the parts are removed from our baking racks and sent to our packing area where we carefully remove the tape and plugs. We then clean all surface areas to remove any glue from masking, debur any powder from the plug areas and wrap your parts for shipment by U.P.S, or customer pick up.